Before sending things to space, roboticists play with LEGO. Robots sure do get around these days. They star in Bjork’s music videos, steal people’s jobs, vacuum, and haunt our dreams. It’s a classic “rapidly expanding field,” robotics is, with applications cropping up in more and more spheres from health care to household chores, manufacturing to space exploration. And though we’ve known the robots were coming for some time now, are we truly ready for them? The Ontario Science Centre is doing its part. Over the weekend, the centre held its annual Robots Rule! event, bringing together local robots and their makers for an afternoon of inspiration and education (in a fun way). Since the year 2000, the Science Centre has been developing its robotics programs and events in preparation for what program coordinator Blair Clarkson says is essentially the impending robot invasion. “[Robotics] is increasingly important not just in all fields of science and technology but also in many, many more areas of people’s everyday lives, yet most still think robotics is too complex and that they’ll never be able to understand it,” Clarkson told us. If there is only one thing we at Torontoist were clever enough to understand about robots at this event, it was this: start small. 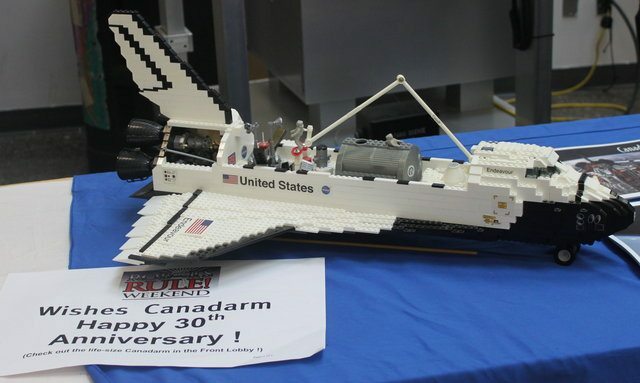 Before building the terrorbots of tomorrow (or, more likely, the Next-Generation Canadarm to perform orbit servicing like refuelling or repair of satellites), the roboticists we talked to started out with LEGO. Or Meccano. Or remote control cars. First year students in U of T's robotics club a sumo robot. “Kids are really good at getting the basic concepts. 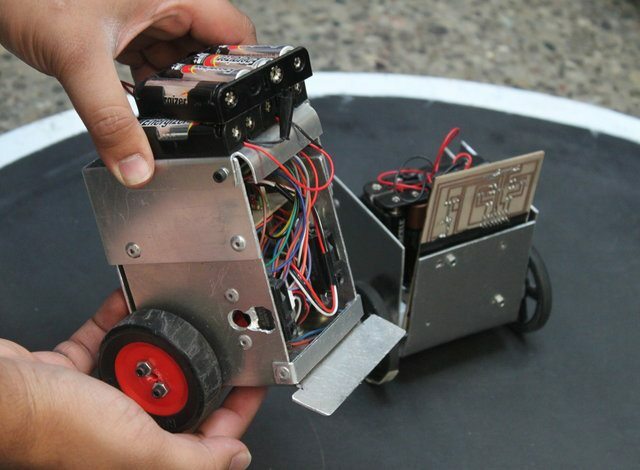 And then if they build a small, simple project, they gain the confidence, and it makes it easier to gradually move on to more and more complicated things,” says Paul Giambuzzi, who was there with the University of Toronto Robotics Association. He recommends kids get involved in these programs early, through summer camps and school programs. Giambuzzi’s not the only one saying the sooner the better for kids and robots. Inspiring young minds is one of the major tenets of the FIRST robotics programs, one of the groups with demos and teams representing at the event. FIRST takes the LEGO training technique to heart, offering robotics programs—built around the brightly coloured Danish building blocks—in schools and communities for children as young as six. After graduating from the LEGO league, FIRST offers a robotics competition for high schoolers, with two FIRST teams also on hand for the demonstrations. The LEGO robots were LEGO sized, but by the time the high school program kicks in, the robots are growing faster than the kids. When fully extended, the robot that Oakville Trafalgar High School’s FIRST team put together was taller than any of the students (or parents). In addition to the established robot lovers, a lot of the audience for the robot demos were kids and families who had just been spending a leisurely Sunday at the Science Centre seeing an IMAX movie or the da Vinci exhibit and happened upon the Robots Rule event—strategically set up right beside the gift shop. Rehman Merali, an aerospace engineering graduate student at U of T, says he was taken aback by how pumped the kids were to see the robots, and by the “really intelligent questions” they asked. He adds that despite the stereotype about boys and robots, the girls were just as into it. Andrew D’Souza was almost foiled on two separate attempts to demonstrate how his S.I.G.H.T.–equipped wheelchair can recognize faces and autonomously follow people (provided they don’t make any sharp turns) because kids kept jumping in the path of the chair to stare quizzically at the controls. And it was evident from the day’s events that great teams, great mentors, and starting small can spark a robot invasion. Or, you know, inspire a team of enthusiastic scientists and engineers to build some eminently practical robotic application that greatly improves humanity and is not scary at all. So bow to the children, robot overlords of the future.